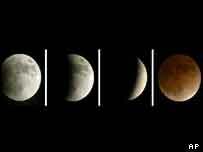 A total lunar eclipse has been visible this weekend from Europe, Africa, the Americas, and much of Asia. The Moon regularly passes into the Earth's shadow and becomes dimmer. It happens about every six months or so. A lunar eclipse has no great importance astronomically but can be enjoyed by many people without special equipment. The Moon started to enter the outer edges of our planet's shadow from 2215 GMT on Saturday. Mid-eclipse took place between 0106 and 0131 GMT on Sunday as the Moon transited the southern edge of the Earth's shadow. Totality was quite short this time because the Moon only passed just inside the full shadow of the Earth, and the Moon's southern edge, in particular, remained fairly bright. As the show progressed, the Moon got dimmer and turned reddish during mid-eclipse, when the only light that could reach the lunar surface was red light refracted through the Earth's atmosphere. Astronomers scrutinised the Moon's surface through telescopes to note how its appearance changed as the Sun was obscured by the Earth. The Moon left the last bit of shadow at 0422 GMT. Skywatchers in North America were able to see the eclipse begin in twilight as the Moon rose on Saturday evening. Although lunar eclipses have no great scientific significance, they are a spectacle of nature that delights and enthrals. In the past things were different. It was a portent from the sky, possibly a sign of divine displeasure. But as superstition has given way to reason, a lunar eclipse has rightly come to be regarded as an example of the majestic clockwork of the heavens. Thomas Hardy said the movement of the Earth's shadow over the Moon had an "imperturbable serenity". The colour effect is the stuff of myth and legend. An account in 331 BC said: "...all her light was sullied and suffused with the hue of blood." 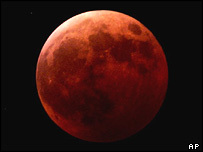 Some ancients called it "the time of the blood of the Great Mother's wisdom", linking the Moon's colour with menstruation. This was a natural thing to do given the link between the length of the month and human fertility. In 1503, Christopher Columbus, stranded in the Caribbean, used a lunar eclipse he knew would take place to impress the natives and secure respect and fear, as well as a regular supply of food. In the UK, countryside campaigners have used the eclipse to highlight the increasing problem of light pollution of the night sky. The Moon was visible in southern England and East Anglia, although dense cloud blocked the view in the north of England and Scotland. But the CPRE says scattered light from towns and cities is all too often snuffing out the stars - however clear the skies may be. "A lunar eclipse is spectacular, but more often than not the sky in which it appears is smeared with an ugly orange glow from light pollution," said Tom Oliver, the CPRE's head of rural policy. "Why should thoughtless, wasteful outdoor lighting spoil so many people's views of the heavens?" "It's a very attractive and impressive thing to see"